1. Start off by serving favorite dishes with new, unprocessed ingredients. One of the first dishes I made was pasta with a new homemade pesto sauce. I was afraid my kids would reject the green sauce, but I had high hopes that their love of pasta and the good flavor of the sauce would win them over. I also made sure the sauce was not too garlicky. When I put the pasta on the table, my then-four-year-old said, “I’m not eating this.” My older daughter decided to take a small bite, and declared that she liked it. With one kid on board, my four-year-old changed her mind and decided to give the pasta a try. She liked it too. I was ecstatic with my victory. Some other ideas for starter recipes include pizza, mac ‘n cheese, and chicken fajitas. 2. Act calm and casual when serving new foods. My first instinct was to make a big introduction to the new dish, explain it, and apologize for the vegetables, but, thankfully, I stopped myself. I just put it on the table and forced myself to act casual and normal. I think acting like nothing was different helped my kids see that it was just another meal. 3. Remember one person can start a domino effect. I find that if one person expresses how much they like a new dish, then the others are likely to try it. Although every family member doesn’t love every new dish, I’m satisfied if they at least try it. “Make Your Own Bars” are very popular in my house, especially for my pickiest eater. Giving choices helps take the struggle out of food. I will often spread out the ingredients on the counter, and let the kids assemble their own dish. For example, a “Make Your Own Salad Bar” includes one or two kinds of lettuce, various vegetable toppings, a couple dressings, and a choice of protein like chicken, beans, cheese, and nuts. Even if someone doesn’t like lettuce, they can still put lots of healthy toppings on the plate like a deconstructed salad. These same ingredients can also be used later in the week to make other meals like “Make Your Own” pizza, pasta, rice bowl, or taco night. I love when I can prep once and then get more meals out of my effort. When assembling the bar, I keep in mind what I know people in my family like so there will be enough for each person to enjoy. Each family member does not eat every item I put on the bar, but at least they watch others enjoy it. I know my kids will try all the ingredients eventually–even if “eventually” is years away. Also, I teach my kids about nutrition. If my little one makes a plate without a protein or vegetable, I sometimes will say, “oh, you skipped a protein; go pick one.” She usually does, and if not, I never insist. I just keep putting healthy food in front of them in a nonconfrontational way. Stay the course, and be patient. 5. Resist the temptation to hover (plus snack tips). My kids come home hungry after school. The first time I put a healthy snack on the table instead of letting them raid the junk drawer, I didn’t know what to expect. I wanted to hover, but I made myself walk away from the table. They gobbled up the cut fruit and crudité vegetables that I left out for them. I learned that when colorful food is sitting out ready and in front of them, they usually are happy to eat that and are less likely to ask for other snacks. Now, I try to put out fresh fruit, crudité with dip, cheese and crackers, nuts and dried fruit, or homemade granola bars. All these snacks get the kid “seal of approval” in my house. 6. Make only one new recipe at a time so that the other dishes on the table are familiar. My confident attitude of “just serve it” is great, but I’m still a mother who doesn’t want anyone to go hungry. So, my game plan is to make just one new dish at a time. That way, if someone doesn’t like the new dish, he/she can fill up on the other dishes. Sometimes I’ll add something easy to the table like fruit or a leftover just to be sure there’s enough food if someone doesn’t eat the new dish. What I don’t do is play short order chef and make multiple meals. If someone complains that they’re still hungry, I tell them to go over to the refrigerator and grab something ready-made like cheese, yogurt, or fruit. I have been anxious many times before serving new recipes to my family, but looking back, I can see that most of the dishes have been well-received. I’m especially excited when my family asks for the new recipe to become part of our regular rotation. 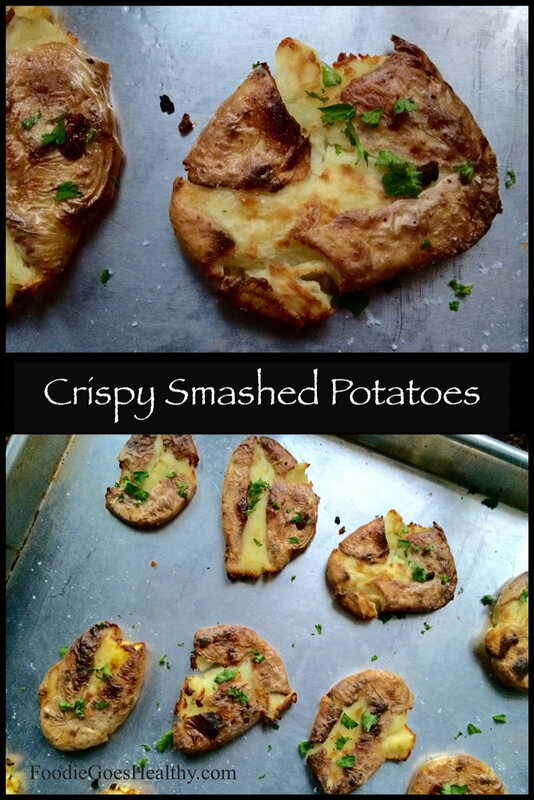 Today, for October Unprocessed, I’d like to share my recipe for Crispy Smashed Potatoes. This is a great starter recipe and a family favorite. Use it as a winning side dish, especially instead of French fries. No need to worry here. This dish is universally well-received by ALL kinds of eaters. In fact, when I served these potatoes at a large family dinner, the potatoes created a stir of excitement amongst the guests before I could get them on the table. Everybody loved them, and even the picky eaters had second helpings. So, if your family loves Crispy Smashed Potatoes as much as mine does, remember to make plenty of extras. These crispy potatoes are easy to make and so addicting. Recipe can be increased for a larger crowd. Note on finding the potatoes: I have seen these baby or pee wee potatoes at the supermarket and at farmers markets. The varieties I recommend include Russian banana fingerling, Dutch yellow, and Sierra gold. 20 mini potatoes I used Russian Banana fingerling potatoes, each about 2 1/2 inches long with a small diameter. Preheat oven to 375 degrees F. Put one oven rack on the second level from the top and another rack just below the middle. Wash and dry small potatoes, and poke them once with a fork so they don't explode in the oven. Place potatoes on a rimmed baking sheet (Do not use parchment-- it burns). Bake on the lower rack for 30-45 minutes or until soft. About halfway through cooking, give the pan a few brisk shakes so that the potatoes rotate around. The total time depends on the size of your potatoes and the particulars of your oven. Let potatoes sit a few minutes until they are cool enough to handle. Move the potatoes to a large cutting board. Smash each potato with a flat object like a sturdy glass bottom or metal pastry scraper. Potatoes should be about ¼ inch thick. Optional: just prior to smashing, score (make a shallow slight cut) on the top of the potato lengthwise for more even smashing. Lightly brush oil on the baking sheet. Place the potatoes back on the baking sheet. Sprinkle potatoes with half the salt and brush (or drizzle) the potato tops with olive oil until lightly coated. Place potatoes on the higher rack under the broiler for about 4 1/2 to 6 minutes or until the tops are crispy and dark golden brown. Watch carefully because, you know, food burns quickly under the broiler. Remove from the oven. Sprinkle with remaining salt to taste and chopped parsley. Serve immediately. 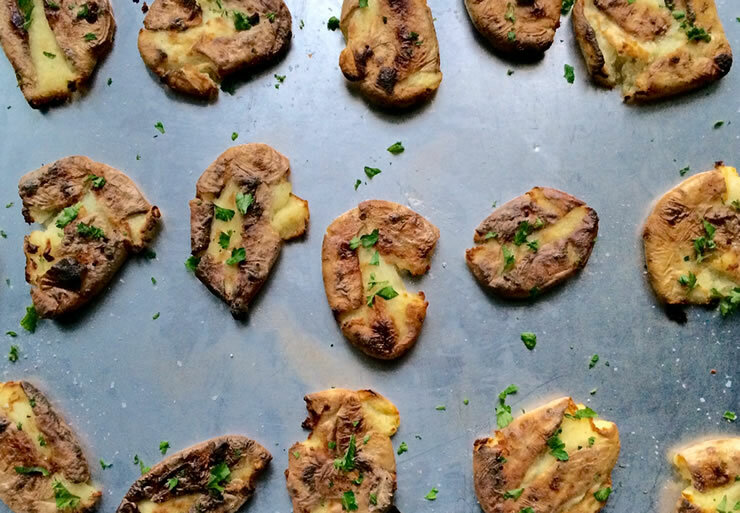 Make ahead strategy: These potatoes can be baked and smashed earlier on the serving day. Let cool, place on the baking sheet, cover, and park in the refrigerator. An hour before serving, take the potatoes out, and let them rest on the counter. Remove cover and place under the broiler just before serving time. Variations: it's also fun to add dried herbs, garlic, pepper, or parmesan cheese to these potatoes right before you broil them. Have you experimented using more widely available potatoes like russet potatoes with this recipe? Small fingerling potatoes can be hard to find. I couldn’t load the Trader Joe’s potato photo on Eating Rules Facebook page, so I put it on my FB page: https://www.facebook.com/FoodieGoesHealthy. Dana – these are great suggestions. I especially love the “make your own bar”. Such a great strategy. And the smashed potatoes are so much fun and with your suggestion of how to do some prep ahead, so doable even on a weeknight. Great post!